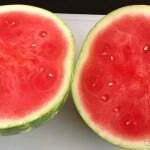 Last Sunday was National Watermelon Day and to honor it appropriately I wrote a post on How To Pick A Perfect Watermelon. In case you didn’t know, today is National S’Mores Day, and since I like S’mores better than I like watermelons I had to give S’mores the spotlight they deserve. So I decided to break out my recipe for Indoor S’mores knowing full well I’d first have to convince you why Indoor S’mores are so much better than traditional S’mores. No problem, says I. 1. You can make them anytime of year. 2. You don’t have to go camping or build a fire. 3. Your marshmallows will never catch on fire. 4. They’re easier to eat and you won’t burn your tongue. 5. The chocolate will actually melt. 6. The chocolate, graham crackers and marshmallow are perfectly balanced. 7. They will be delicious for several days. 8. You can sell them at a bake sale. 9. You can take them on a picnic or in your lunch. 10. It feeds a large crowd and no one has to wait for the roasting stick. So now that I have convinced you of the merits of Indoor S’mores I’ll give you more good news. They only require five ingredients. Okay, okay, traditional S’mores only require three, but did you read the list above? Two extra ingredients are so worth the benefits. Like any recipe, I recommend you use the highest quality ingredients you can get your hands on. Over the years I have tried lots of brands of graham crackers for this recipe. I now only use Honey Maid brand because not only do they taste better but they have the most uniform shape and the straightest edges. This might sound silly until you try to fit inferior crackers in your pan. Just look at the above picture. You can’t reach that level of perfection without straight edges, baby! The biggest problem with traditional S’mores is that the marshmallow doesn’t have enough heat to melt the chocolate bar. It creates a texture problem. We solve this by melting chocolate chips with the marshmallows, a little butter and a little milk. After it is spread all over the graham crackers it will stay soft and become the glue for the S’mores topping. Another problem with traditional S’mores is that the ratio of cracker to chocolate to marshmallow is off. Not so with Indoor S’mores. An even mixture of the three, dumped on top of the cracker base, gives every bite the perfect combination of this baking trifecta. A little time in the oven to melt the chocolate chips and roast the marshmallows and you’ll soon realize what S’mores were supposed to taste like all along. Delish! Not long ago my boys wanted to build a fire in our backyard fire pit. Once the fire was going they asked if we could make S’mores. Since I always keep these ingredients on hand I went inside and made up a tray of crackers, marshmallows and chocolate bars. Then I went on a search for the roasting sticks which I finally found behind the barbecue. After lots of waiting for one of the two sticks to be available, lots of almost perfectly roasted marshmallows that then suddenly caught fire, and lots of arguing over the last piece of chocolate, everyone in my family agreed that Indoor S’mores were better. No one had to convince me. Preheat oven to 350 F. Generously spray pan with non-stick cooking spray. Arrange crackers in a single layer to completely cover pan, cutting crackers to fit edges. Bake in oven for 2 minutes. Cool. In a microwave-safe bowl, combine 4 1/2 cups marshmallows, 4 tbsp. butter and milk. Microwave at 30 second intervals, stirring in between, until mixture is completely smooth. Add half the chocolate (6 oz. ), let sit for 2 minutes then stir until chocolate is completely melted and mixture is smooth. Place back in microwave for 30 second intervals to finish melting chocolate if necessary. Spread chocolate mixture over graham crackers, making sure chocolate goes to the edges and is fairly smooth. Set aside. Coarsely break remaining crackers in a large bowl. Melt remaining 4 tbsp. of butter; toss with broken crackers. 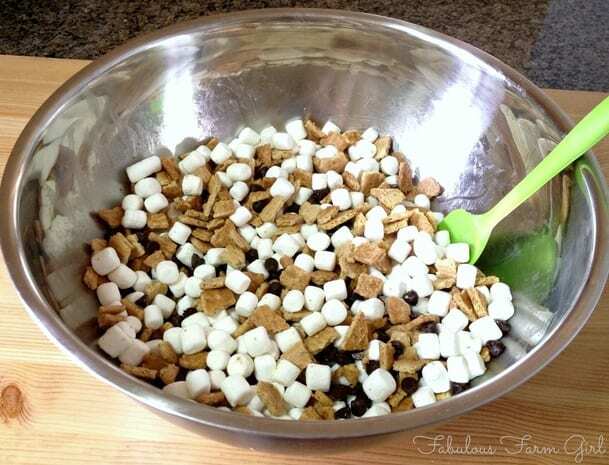 Add remaining marshmallows and chocolate chips: toss lightly. Spread mixture evenly onto pan, all the way to the edges. Bake for 8 minutes or until the marshmallows are melted and just starting to get some golden color on the edges. Cool. Cut into bars, pressing down evenly with a large knife. Store extra in an airtight container. Generously spray 12″ x 18″ rimmed baking pan with non-stick cooking spray. Arrange crackers in a single layer to completely cover pan, cutting crackers to fit edges. Bake in oven for 2 minutes.Cool. In a microwave-safe bowl, combine 4 1/2 cups marshmallows, 4 tbsp. butter and milk. Microwave at 30 second intervals, stirring in between, until mixture is completely smooth. Add half the chocolate (6 oz. ), let sit for 2 minutes then stir until chocolate is completely melted and mixture is smooth. Place back in microwave for 30 second intervals to finish melting chocolate if necessary. Spread chocolate mixture over graham crackers, making sure chocolate goes to the edges and is fairly smooth. Set aside. Coarsely break remaining crackers in a large bowl. Melt remaining 4 tbsp. of butter; toss with broken crackers. Add remaining marshmallows and chocolate chips: toss lightly. Spread mixture evenly onto pan, all the way to the edges. Bake for 8 minutes or until the marshmallows are melted and just starting to get some golden color on the edges. Cool. Cut into bars, pressing down evenly with a large knife. I’ve taken Indoor S’mores to all kinds of different functions. From classroom parties to bake sales, church pot-lucks to bridal showers and people always ask for the recipe. 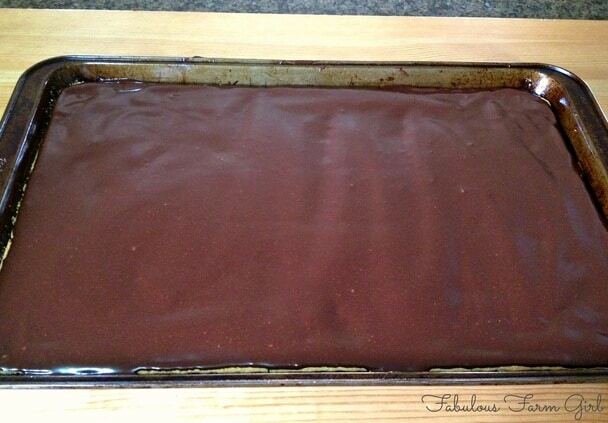 If I’m bringing them to an event, I like to cut off the outside edges, about 1/2″ in, all the way around the pan. This gives every bar a nice clean edge and removes the very outside marshmallows which sometimes get more browned than I’d like. 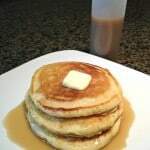 We call these “the dregs” and my boys love them. It also alleviates my guilt when they find out I didn’t make the bars for them. These look AMAZING! thanks for the yummy recipe! You’re welcome Lauren! I know you’re gonna love them. Have a fabulous week. What a great, easy idea! I think my older kids could make these themselves. Pinning! Great minds think alike, Kelly! My teenagers made these recently for a bbq they were invited too. In that case, I got the “dregs”. I wasn’t complaining about it, that’s for sure. Have a fabulous week! AWESOME! I am visiting from #SITSsharefest and I am not typically a recipe girl, but this is brilliant! I have 2 kids under 4 and s’mores are just a mess (plus too hot, the fire issue etc.). I love this as an alternative until they get a little older and/or as something to make ahead or do when you don’t have fire. Pinning!! Love your comment Susan! My boys are teenagers and s’mores are still a mess for them. LOL! Like I said in the post, last time we made s’mores over a fire they all said they prefer the taste of Indoor S’Mores. I’m sure your family will agree. Have a fabulous week. What a great idea! Love This…must try before school starts 😉 Thanks for sharing. You’re welcome Tiffany! School starts tomorrow for my kids and they all have one packed in their lunch bags. They were very excited. Have a fabulous week! Thanks Caylee! They are delicious and are sure to ruin you for traditional s’mores. Enjoy! Thanks for sharing at Family Fun Friday! Just dropping by to let you know you’ve been featured this week! Thanks so much for the feature Danita! You made my day! 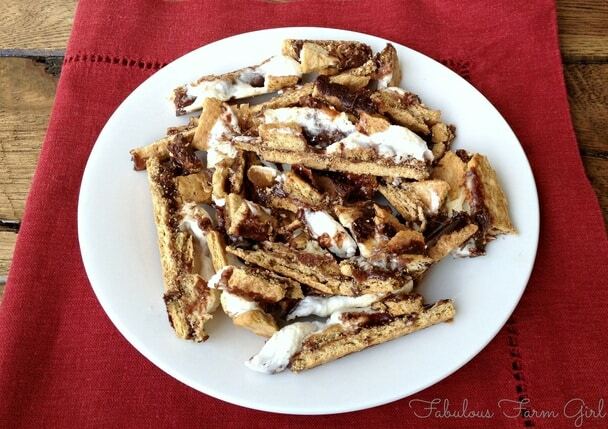 Wow – this is one awesome recipe – yes to smores ALL year long! Visiting from SITS! I agree Shashi. And once you try these Indoor S’Mores you might just ditch the campfire altogether. Have a fabulous week! Hi Ashley–so glad you stopped by. Thanks for the share and have a fabulous week! You’re welcome Michelle! It really is a family favorite. My boys actually prefer these over regular s’mores which is totally alright with me. Thanks for stopping by! 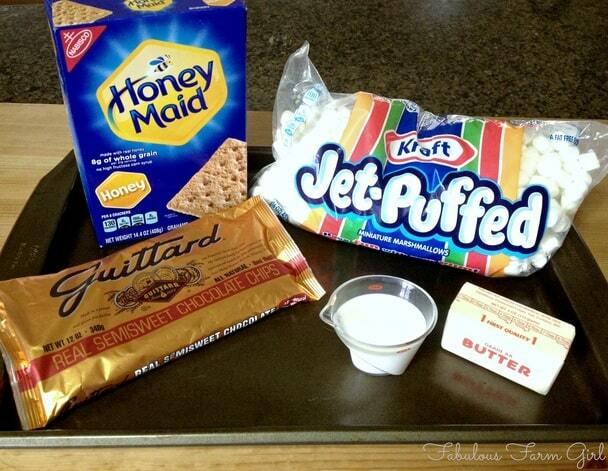 What a great indoor and easy recipe for s’mores. Stopping by from SITS Saturday Sharefest. It’s the only way we ever eat s’mores now. You’re gonna love them! Thanks for stopping by! Mmm these look so good. 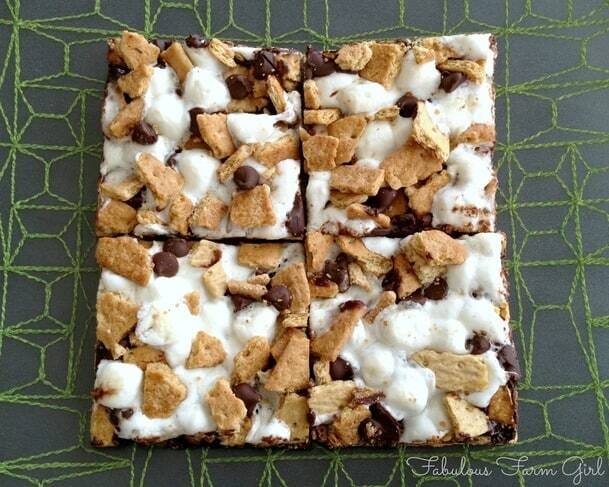 All the delicious flavor of s’mores without the mess! Thanks Stephanie–they really are fantastic. My boys actually prefer them to campfire s’more probably because they get more. You just have to try them! 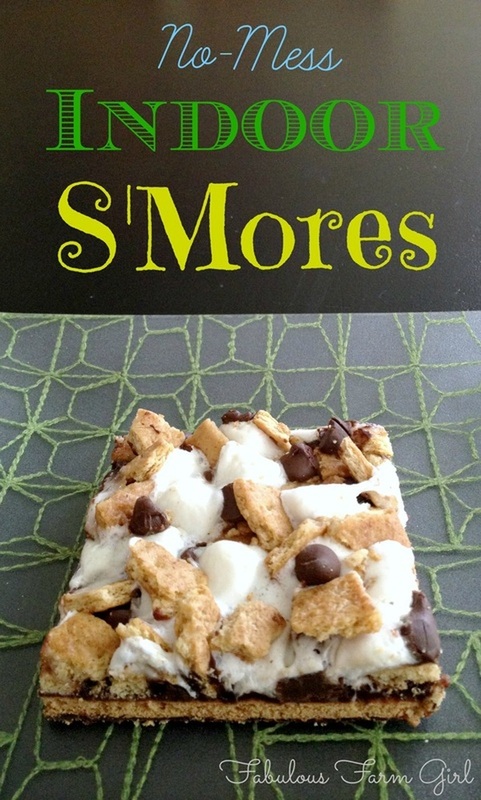 We are such big fans of making smore’s and this will be perfect for year round! Can’t wait to try it with the kids for our Summer bucket list! Hi Joann–we love s’mores around here too. But this version is so good my boys actually prefer it over campfire s’mores and I have to agree. You’re family’s gonna go nuts over them. Have a great week! Great idea, they look delicious! Happy SITS Blogging! Thanks Lori–they really are. I promise! You’re so welcome Joan! My boys actually choose these over regular campfire s’mores. I asked my middle son why and he said it was because it makes more. Typical. LOL! If you make these for your office, I guarantee you will become everyone’s favorite person. The question would be, is that what you want? LOL! Thanks for stopping by and have a great week! Mmm. These look so yummy! Thanks for sharing. I can’t wait to try them. And I love the tip about the dregs. You’re so smart! You’re so welcome! I don’t know if it’s about being smart or about having 3 teenage boys that are always trolling for food. LOL! Necessity is the mother of invention I guess. Thanks for stopping by! Hi Dylan–First let me say that you are the sweetest young lady for taking care of your mom and making her a treat. You just need a large cookie sheet that has a rim all the way around it. 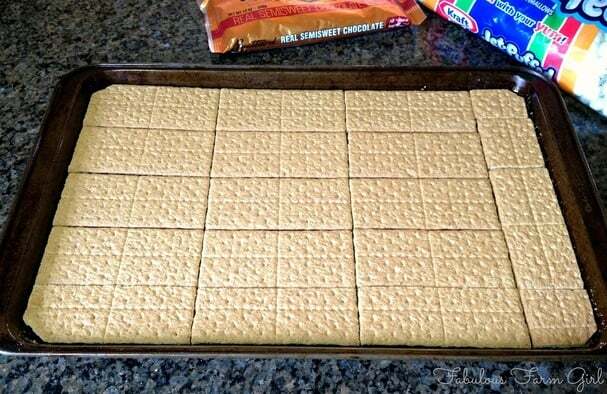 If it’s a little bit smaller that’s okay, just cut and place the graham crackers so they fit to the edges. Hope that helps and good job learning how to cook!